Fitment: Universal fits most roof rack system with cross bars. To ensure correct purchase,please check your cross bar size before you buy. Tie-down strap size: approx 350mm(14inch) length, 25mm(1") width. Nylon Strap size: 1130mm(3.7feet) length,25mm(1") width. Flexible four point saddle system, which adapts to kayak hull design. Hold your kayak in place, occupy minimal space on load bar. Can load from either side of vehicle. Install or dismantle from roof rack system in seconds. High strength nylon straps and necessary hardware included. Carry your kayak/canoe/surf board anywhere while you are on the go. 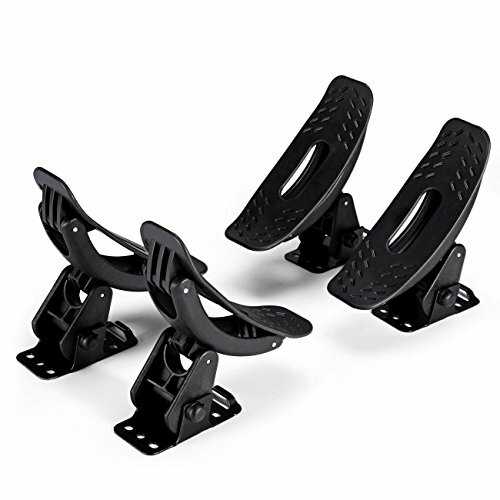 Package Included: A set(4pcs) of Kayak carrier holders for cross bar.